Previous post in this series: Discovering SCP Workflow – Workflow Definition. In my mind, user task types are special, in that they involve a human, and as such need extra moving parts to work. 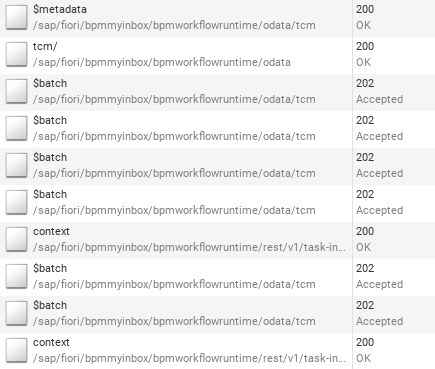 As you probably know, when you enable the Workflow service in your SCP cockpit, various things are provisioned, including the My Inbox app in an SCP Portal service based Fiori Launchpad (see Discovering SCP Workflow – The Monitor). It’s in this global workflow worklist app that user tasks appear, and remain until the user takes action (such as to accept, reject, continue or otherwise make known their decision or action related to that specific step in the lifetime of the workflow instance). They can also be suspended or terminated by an administrator. 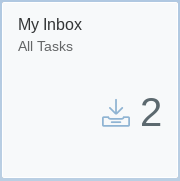 We see that the My Inbox app is presenting 2 to-be-completed workflow items – user tasks – for me to process. 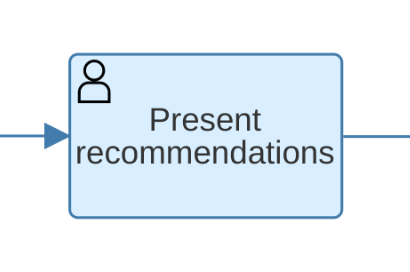 It just so happens that both user tasks are the same (to select recommended beers), but My Inbox collects together all user tasks from all types of different workflow definitions. We’ll cover some of these now and some in the next post, but I don’t want to dwell too much on the mechanics of the User Task Properties themselves – there’s already a post by Seshadri Sreenivas R “How Configure SAP CP Workflow User Tasks” which covers this in great detail. What UI5 app? How do I build it? What are the requirements? Well, we’ll cover some of this in this post, and complete the picture in the next post. To set the scene, though – let’s look at the context in which the UI5 app appears – the My Inbox app. That’s better! Much more friendly. What can we discern from this URL? TCM stands for Task Consumption Model, by the way. This of course is the value that’s shown in the dynamic tile earlier. The answer to that question is simply that there’s a lot to learn by looking at what network calls are made. So let’s continue. When we think about it, it’s obvious that the My Inbox app and everything to do with it is going to make use of the Workflow API. Even before it’s loaded, in the case of the dynamic value on the tile as we’ve just seen. (Even though I value the performance improvements of batching requests up with OData’s $batch, it does make me grimace somewhat when I’m trying to see what’s going on behind the curtain. Yes, I can use setUseBatch to hack the model so things aren’t batched up, but that’s not the point. Perhaps setting debug mode on in UI5 should also turn off batch mode for OData models. What do you think? Let me know in the comments below). 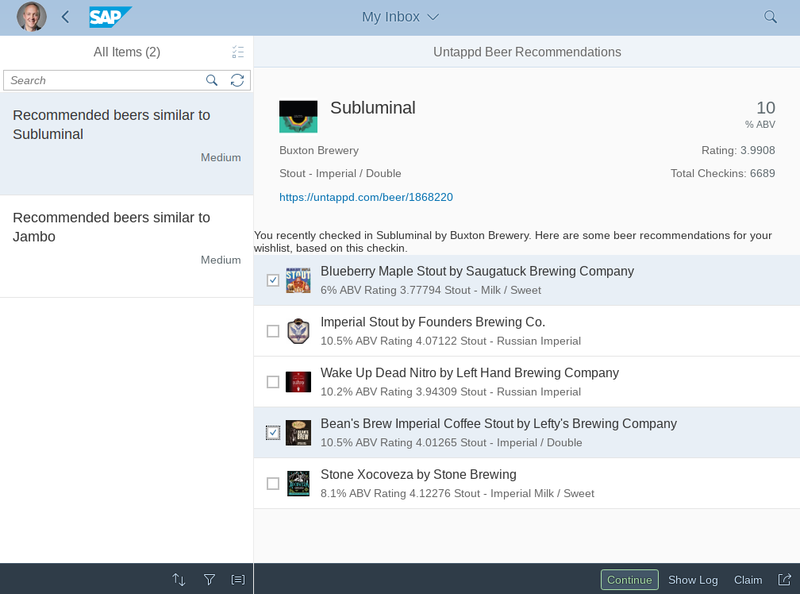 At this stage the UI looks like the screenshot earlier – the My Inbox app showing two entries in the master list, with the first one selected and showing the detail (for beer recommendations related to my checkin to Buxton Brewery’s Subluminal). 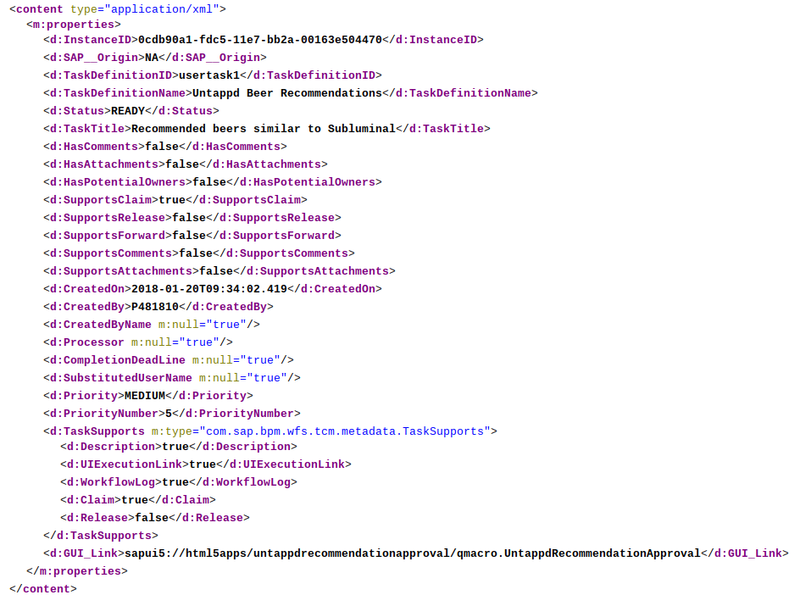 These requests to URLs containing “bpmworkflow” tell us quite a bit. Let’s dig in. The first request shown ($metadata) is for the metadata document that describes the tcm OData service that we saw earlier. That OData query operation returns a collection of two entities. Yes, you guessed it, those two entities are the two tasks shown in the master list in My Inbox. There’s one particular property that catches my eye. And it’s what I’ll leave you with to take us through to the next post. First though, a question. How does My Inbox know how to represent a particular user task? Going back to the high level steps described earlier in the official documentation, we have step 4, which says: “specify the UI5 app you’ve built for presenting and handling the user task”. 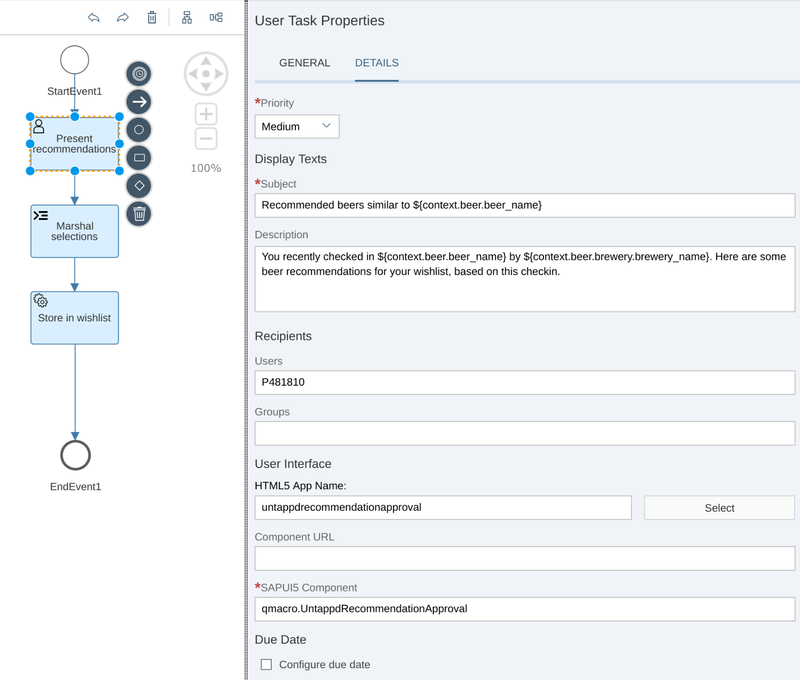 Well, it represents a user task with this very UI5 app you’ve specified for that particular user task in that particular workflow definition. was bound into the instance, so that when it comes to the crunch, and My Inbox needs to display that particular user task, it knows which UI5 app to load. Magic! * S3 is traditionally the detail view, and specificially the detail view in a scaffolding-based app. Did anybody notice that My Inbox was a scaffolding-based app? Let me know in the comments what you spotted in this post that suggested it was. We have a couple of workflow instances, and we’ve seen how the My Inbox app retrieves information for them, and when it has to display the details for one of them, we know how it works out how to display those details. In the next post, we’ll keep on digging, and look at understanding what happens when a task UI component like this one (the Component of qmacro.UntappdRecommendationApproval) is instantiated. How does it know what to do, where to get the information from, and so on? Next post in this series: Discovering SCP Workflow – Component Startup.